Oliver & Bonacini has been planning events since 1993 offering private dining rooms in each of their restaurants. Over time they have built a portfolio of exclusive event venues, allowing them to provide O&B quality, service and style on a grand scale. O&B offers an extensive portfolio of unique, stylish event and restaurant venues, each one supported by Oliver & Bonacini chef-driven cuisine, professional and personal service and a team of dedicated Event Specialists. The diversity of their spaces allows them to host a wide range of events, such as closing dinners, business meetings, personal celebrations, weddings, kosher-catered events, bar mitzvahs and large corporate events. While each venue is unique, with distinct differences in both décor and cuisine, they all share the same commitment to exceptional service and respect for food. In addition to their restaurant and event venues, they are also extremely proud to offer direct-to-venue catering at the location of your choice, featuring O&B’s signature chef-driven cuisine. Passionate about crafting flavourful, seasonal dishes for a diverse range of events, Chef Michael Robertson has worked with Oliver & Bonacini for more than 13 years. After graduating from George Brown College with a diploma in Food & Beverage management, he began his culinary career as the Chef de Cuisine at the Scarborough Golf & Country Club. 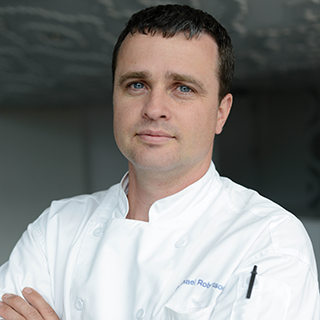 In 2005, Chef Robertson was hired as a cook at Canoe, O&B’s critically acclaimed Canadian-inspired restaurant, where he worked his way up to Senior Sous Chef. In 2009, he was appointed Senior Sous Chef of Auberge du Pommier, where he executed traditional French dishes with a distinct modern flare.